This report explains our fair-value model for high-yield. 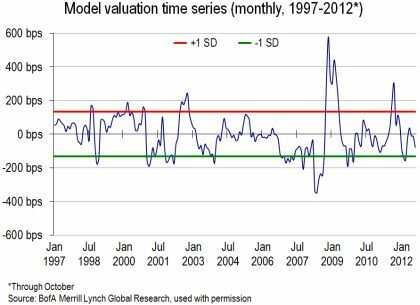 It evolved from an effort to develop a more useful valuation reference point than the historical average spread. With high statistical significance, the model indicates when it is attractive to increase exposure to the high-yield asset class. Econometric modeling of the high-yield spread-versus-Treasuries dates to research conducted at Merrill Lynch in the mid-1990s (see note 1 below). Within the past year, at least one sellside firm has introduced its own version of the technology. The path to an econometric model of the high-yield risk premium began with research challenging the traditional valuation approach. In the 1980s, traders judged the market rich or cheap depending on whether the spread was above or below its historical average. Buying and selling on that basis, we found, did not produce better absolute or excess quarterly returns (note 2) than a buy-and-hold strategy. This result puzzled market participants. Upon reflection, though, it made perfect sense. The spread represented a risk premium. Therefore, the average spread was the correct spread only on the rare occasion when risk happened to be average. When risk was above average and the spread was above average by a commensurate amount, high-yield bonds were not cheap, but fairly priced. Misvaluation occurred only when the risk premium was out of line with risk. The trick was to quantify the risk. Despite a once-widespread notion that persists even today, default risk is not the whole story. In round numbers, the historical default rate on high yield bonds is 4.5% per annum, and the average recovery rate is 45% of face value. 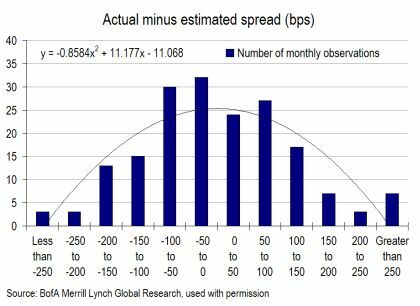 That implies a required spread of 4.5% x (1 -0.45), or about 250 bps. 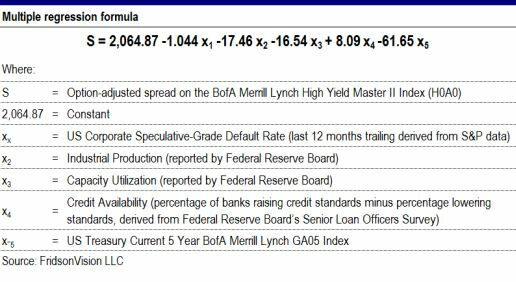 The historical average spread of the BofA Merrill Lynch High Yield Master II Index, however, is approximately 600 bps. To hear the high-yield boosters of yesteryear tell it, the difference (350 bps) represented a free lunch (note 3). The extra spread supposedly resulted from conventional investors’ irrational aversion to “junk” companies, which the rating agencies systematically underrated. There was just one flaw in this claim of a gross, glaring, and persistent market inefficiency: When analyzed in a Modern Portfolio Theory context, the high-yield asset class landed very close to the Securities Market Line (a graph of mean return versus standard deviation of return), indicating little or no chronic undervaluation. The possibility remained that in some periods the high-yield market was underpriced or overpriced, relative to its then-prevailing risk. Identifying such episodes necessitated considering not only default risk, but the full risk of owning speculative-grade bonds, including the risk of illiquidity. Rational investors demand to be paid for the fact that they cannot convert their high-yield holdings into cash as readily as they can their Treasuries. To capture as much of the total risk of high-yield bonds as possible, my collaborators and I over many years have tested a variety of potential explanatory variables to incorporate into a multiple regression analysis. The accompanying table details the five variables in the present model, developed in collaboration with Finnerty Economic Consulting. This model explains 82% of the historical variance in the option-adjusted spread (OAS) on the High Yield Master II Index (adjusted R2 = 0.82). For any given month, the spread calculated with this formula represents our fair-value estimate of the high-yield risk premium. The accompanying chart shows how the actual spread compares, month by month, with the fair-value estimate. If the market is exactly at fair value, that month plots at zero on the vertical scale. Inspection quickly discloses that in most months the actual spread is somewhat greater or less than fair value. Occasionally, the divergence reaches an extreme, defined as one standard deviation (133 bps). These divergences reflect transitory risk factors. Value-oriented, multi-asset investors will increase exposure when the spread greatly exceeds the level justified by the perennial risk factors listed in the table above. They will reduce exposure when the spread is far below the fair-value estimate. For managers who operate exclusively within high-yield, undervaluation implies an aggressive stance and overvaluation a defensive stance. Also of interest from a statistical viewpoint is the next chart, a histogram of the monthly actual-minus-estimated data. The computer-fitted curve approximates a bell-shaped curve, suggesting that the monthly differences are normally distributed. This implies that the monthly observations do not suffer from the defect of serial correlation. Despite the modest number observations outside the Fair zone, these results stand up to statistical scrutiny. The excess return following cheap months is different from the comparable figure for fair months with 99% confidence. Excess returns following cheap months are also different from excess returns following rich months with 99% confidence. Rich months are different from cheap months with only 80% confidence, which is below the threshold customarily deemed statistically significant. Note, however, that because of their large yield cushion, it is impossible for high-yield to underperform Treasuries without suffering a major relative price decline. For example, in calendar 2001, high-yield’s total return difference versus five-year Treasuries was negative 3.03 percentage points. In that year, the high-yield index lost 4.76% of its value, versus a 2.52% gain in value for the five-year Treasury index. This suggests that investors who care about capital preservation should cut back on high-yield when the FridsonVision model finds the asset class is extremely overvalued, even though the average total-return difference between fair and rich months is too small to achieve statistical significance (note 5). Finally, let us underscore the difference between our method, which compares the actual spread with fair value, and the traditional comparison with the historical average spread. On March 31, 2002, the OAS on the Master II was 708 bps, nearly 100 bps wider than the historical average for our observation period. The FridsonVision model nevertheless indicated that the OAS was 176 bps (1.3 standard deviations) less than fair value. This meant that high-yield was extremely rich. The model was vindicated when the Master II outperformed five-year Treasuries by 11.24 percentage points over the next 12 months. Bottom line: The important consideration is not where the high-yield market is trading relative to where it trades under average conditions. What matters is how high-yield is priced relative to its prevailing risk. 1. In 1993, Martin Fridson and Jeffrey Bersh showed that deviations from historical average spreads had no value in predicting quarterly absolute or excess returns on high-yield bonds. The following year Fridson and Jón Jónsson introduced a multiple regression model that explained 72% of the variance in the spread of the high-yield index over 10-year Treasuries. Christopher Garman, also working in the Merrill Lynch high-yield research department, improved upon that model, as subsequently detailed in Garman, M. Christopher, and Martin S. Fridson, 1999. “Monetary Influences on the High Yield Spread versus Treasuries.” High Yield Bonds: Market Structure, Portfolio Management, and Credit Risk Modeling (McGraw Hill), Theodore M. Barnhill, Jr., William F. Maxwell and Mark R. Shenkman, Editors: 251-268. Subsequent work by Fridson and collaborators including Greg Braylovskiy, Vince Kong, and Camille Mcleod-Salmon used the option-adjusted spread. 2. Excess return is the return of the asset class minus the return on ostensibly default-risk-free Treasuries. 3. The most common valuation model in use today compares the spread-versus-Treasuries with the sum of the current default loss rate (defined as [default rate] x [1 minus recovery rate]) and the average difference between that rate and the spread. The difference is taken to represent the high-yield market’s illiquidity premium. Most users of this model fail to adjust for the fact that illiquidity, like other high yield risks, varies over time. In reality, separating default risk from illiquidity risk, as this method attempts to do, is not feasible because the two are interconnected. A sounder approach is to analyze the total high-yield spread as a function of risk determinants like the explanatory variables in our model. 4. High-yield bonds are most commonly issued with initial maturities of 10 years, but are typically retired well before maturity. The five-year Treasury index’s duration tends to be close to the high-yield index’s. On average, during our observation period, the five-year Treasury has ranged from 0.9 years longer to 1.2 years shorter (in modified duration) than the Master II, with a mean of 0.5 years shorter. 5. When the outlier returns of 2008-2009 are included in the analysis, the difference between the excess returns following fair months and rich months is significant at the 99% level.